First year SPIN farmers are signing up for their farmers markets, and this is when I get what I call emails of doubt. "How will I stack up? How can I compete? I'm just a small fish in a big pond. Who will buy my produce?" If you, too, are facing your first season jitters, here's how to psych yourself into a $500 market week - and beyond. Foodie is mainstream: The Food Network has turned food into entertainment, and the most interesting developments in the food world are at everybody's fingertips on Facebook/Instagram/Twitter. Government policies and health advocates are also turning up the volume on nutrition. So customers are becoming much more adventurous in their tastes, and appreciative of quality. This gives SPIN farmers increased pricing power and infinite opportunities to differentiate themselves from other growers. You're embedded in your market: Unlike many growers who retreat to the middle of nowhere when the market is done, your always just a stone's throw from the action. You just have to look and listen to what's around you. Follow the lunch trucks around to see what they are offering. Read the trendy menus conveniently placed for you outside the door or on the sidewalk. Check out the pop-up restaurant in a warehouse. Ask neighbors, friends and family what they need and want. Then go grow it. Being market responsive gives you a real big advantage. Think like a retailer: Make your stand and your marketing stand out. Pre-bag produce. Loose produce makes for slow processing time and frustrated customers. Come up with a pricing system that makes it easy for customers to spend their money. Create your own price, using SPIN's mix and match unit pricing. Unitizing and packaging can take many forms. Come up with your own deals, like combining recipe-ready crops in a single bag or bundle and sell at special price. Change up the presentation of some of your crops from week to week, and tie them in with commonly celebrated holidays or local events. Finally, don't look at fellow vendors as competition, but rather as colleagues. 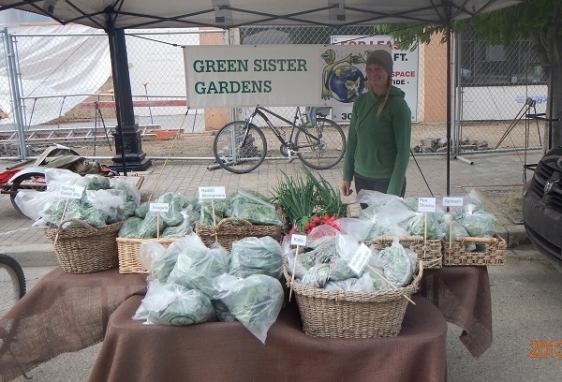 It takes more than just a few vendors to create a destination point farmers market. More vendors means more product, and that means customers have a better chance of having a satisfying experience. That will keep them coming back to the market, and to you, you farmer rock star. Kerri Fox of Green Sister Gardens rockin' out in Moose Jaw SK. What if you don't have Madonna's chutzpah? Here's some tips for the shy farmer. GET MORE TIPS ON SELLING FROM PRO'S LIKE KERI FOX. JOIN OUR COMMUNITY HERE.